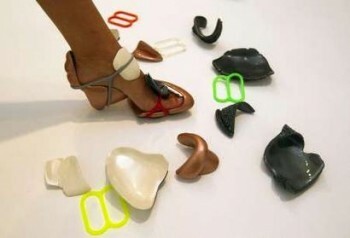 Mix and match the endless possibilities with Sharon Golan’s Mr. Potato-esque DIY shoes. 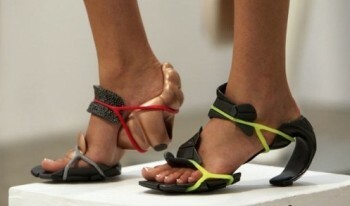 When it comes to fashion, and sustainable fashion, shoes may be one of the worst offenders. Not only do shoe fashions change rapidly, but they also tend to wear out faster than our other articles of clothing. Shoe designers and producers have tried to find solutions to this ecological conundrum, with Nike introducing a shoe recycling program and other designers creating multi-functional and multi-fashion shoe designs. The solution, as Israeli designer Sharon Golan proves, does not have to be boring. Making a versatile, sustainable shoe that lasts longer and is lighter on the resources (due to its versatility) can be fun. Enter Shell 256, Golan’s shoe design with a collection of 16 modular shoe components that can be combined and used to create 256 different variations of shoes. Exhibited in Jerusalem a couple weeks ago, the shoes are a combination of four separate recycled plastic pieces that are held together with multi-colored silicone rubber bands. Any of the components can be changed. “That gives you, the client, more options and it gives the industry, the company, the option to have you as a client all the time,” she pointed out. Agreed. And they’re not attractive. Hopefully the concept will lead to an improved design. These look very uncomfortable. Such shoes would not support the feet well and could even lead to foot damage based on studies of the effect of shoes that are designed for fashion rather than walking comfort.